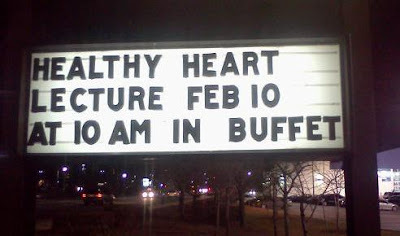 Apostrophe Catastrophes: And Next Week: Healthy Liver Lecture at the Bar! And Next Week: Healthy Liver Lecture at the Bar! Spotted at a mall in Watertown, Mass., this sign doesn't contain any grammatical errors, but I found it hilarious nonetheless. The only lecture topic the Old Country Buffet would be less qualified to address is depression. Making alterations in your life might be frightening, especially when it takes a lot of will-power and persistence to beat it. However if you simply tend to be serious about overcoming this, you have to make the necessary changes to develop, create and design the lifespan you desire for yourself and consider detoxofsouthfl.com for that assist http://thetipsguru.com. You can't-a have-a de Mango!